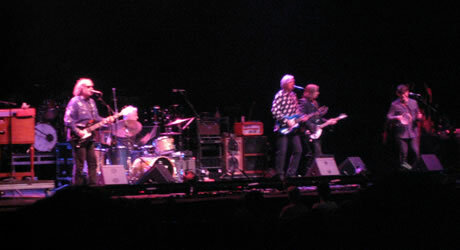 Robyn Hitchcock & The Venus 3 (including Peter Buck of R.E.M. 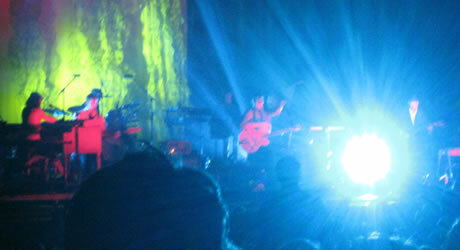 and Bill Rieflin of Ministry, R.E.M., and The Humans) opened with an enjoyable 30-minute set. I was unfamiliar with Hitchcock, but by total coincidence had just days before seen his appearance in Jonathan Demme’s Rachel Getting Married. His quirky non sequiturs between songs (“I had a root canal this morning, which is why I’m wearing a hat” – which he wasn’t) contrasted with his focused, tight songs. 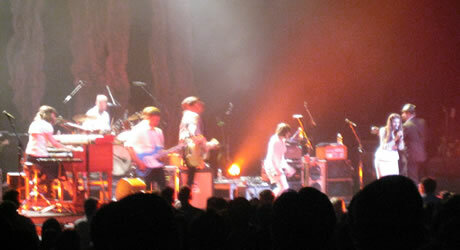 The Decemberists’ Colin Meloy briefly joined in on tambourine and backing vocals. I’m a latecomer to The Decemberists, only catching on with their third album The Crane Wife (2006), which features a guest appearance by Laura Veirs, one of my favorite singer/songwriters, on the wonderful track “Yankee Bayonet.” My interest was further piqued by a review (that I now can’t track down) that compared them to early Genesis, of which I am also a longtime fan. It’s a bold comparison, for few would classify The Decemberists’ music as progressive rock. But it is fitting insofar as their compositions are often epic narratives, encompassing styles ranging from pastoral folk to hard rock, all performed with high musicianship that eschews flashy individual soloing. Further bolstering their prog rock cred, the first half of The Decemberists’ set was the entirety of their 2009 concept album, The Hazards of Love. In retrospect, a concept album was inevitable for a such a band that had already shown a penchant for lengthy story-based songs like “The Mariner’s Revenge Song” (on Picaresque, 2005) and “The Crane Wife Parts 1-3.” Compared to Genesis’ grand but slightly inconsistent epics “Supper’s Ready” and The Lamb Lies Down on Broadway, The Hazards of Love is actually one of the most cohesive concept albums I’ve heard. It rivals The Who’s Quadrophenia for clarity of vision and cohesiveness of its recurring musical themes. An instrumental organ intro (sorry to keep bringing them up, but possibly an idea borrowed from Genesis’ “Watcher of the Skies”) launches the epic fairy tale. The role of a girl that falls in love with a forest creature is sung on record and live by the airy, sweet voice of Lavender Diamond’s Becky Stark. My Brightest Diamond’s Shara Worden, a pint-sized, multi-instrumentalist powerhouse, blowed everybody’s hair back as the evil forest queen. How does a girl that small have such powerful pipes? Although a few tracks can stand on their own (especially “The Rake’s Song”), the entire suite deserves to be heard in one piece. It was a very bold move to release a 58-minute song suite at a time when the long-player album is dying, and music is consumed track-by-track and randomly shuffled by iPod algorithms. Personally, I had found the album a little slow to absorb, but now that I’ve witnessed the whole thing live… wow. It’s brilliant, and made to be experienced live, in one piece.